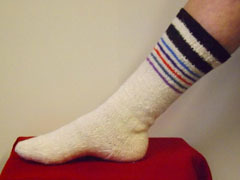 The coloured stripes in Tristan's hand-knitted woollen socks provide a unique way of sending a message to your loved ones. Why not join in and use the Tristan Islanders' unique way of declaring your love? Knitting has been a custom on Tristan da Cunha for many years and Tristan ladies were always busy knitting socks, stockings, sweaters, pullovers and underwear such as men’s drawers and bodices. Throughout this time the language of socks was born and has held a special place in the island of Tristan da Cunha’s heritage. Although this tradition occurred many years ago, it is still remembered today and so socks have a special meaning on this small island. In the old days the community of Tristan was rather shy and so were people of few words. 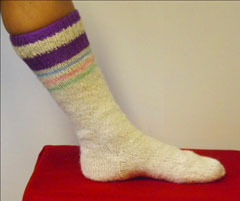 Love and affection was often shown by gestures and one particular gesture was the knitting of socks, which held a special significance. When a young man wanted to court a young lady he would visit the parents house bringing a small gift and sit with the family in the kitchen. The father would know this was a sign that the man had an interest in one of his daughters. 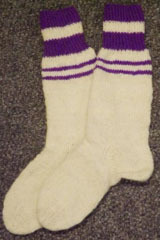 The young lady in question would in turn knit a pair of socks for her young admirer, depending on the number of colours and stripes on the socks, the young man would know how fond she was of him. If the young man was happy with the message his socks showed, he would take this as a sign of the young lady’s affection and make her a pair of moccasins, which was always previously done by her father. The young lady would then offer to wash his clothes and this was a sign that they were formally engaged and a marriage would follow shortly. 2 Large Stripes and 6 small stripes - Will you be mine? Left: Loyalty - Centre: Friends Forever - Right: Head over Heels in Love! Tristan has often been called the love island and is the place where many outsiders and islanders return to be married. One feature which enforces this is Queen Mary’s Peak, the highest point on the island. 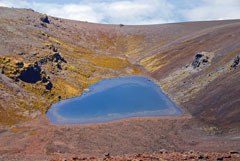 At the summit lies a lake, which is very unique, as the forces of nature has shaped it into a heart. This heart shape lake is portrayed on our Love Sock Logo to portray that love truly reigns here. So, if you hold someone in great affection, whether it is a spouse, parent, sibling or friend and you want them to know how much they mean, why not show them by sending them a pair of Tristan "LOVE SOCKS" from you to them.